Solar power continues to make inroads into the nation’s generation base. Solar power is still relatively miniscule with only about 10,000 megawatts of the overall 1 million megawatts of installed capacity in the U.S., but its recent growth has been more rapid than any other form of generation, and that could fuel further concerns about a utility death spiral. Cheap, efficient and abundant natural gas continues to hold the lead as the energy source of choice for new generation, adding 8,329 MW in 2014. Wind turbines still represent a significant share of new additions – 4.802 MW in 2014 – subject, of course, to the winds of political policy. But solar power added 3,408 MW in 2014, fueled not only by subsidies but also by declining costs. The average price of photovoltaic cells has fallen 60% since 2010, making it ever more attractive to install solar panels in fields, parking lots and on houses. That is the prospect that keeps utility executives up at night. That is the death spiral in which solar power grabs market share, adding to the costs utilities have to pass on to consumers, leading, in turn, to higher rates that makes solar power even more attractive to consumers. In fact, the EIA data does not even give the whole picture. 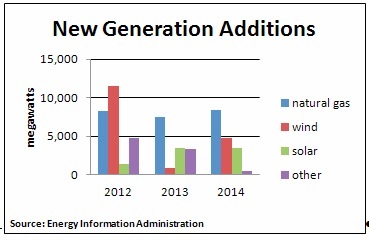 It does not include new generation sources under 1 MW, such as rooftop solar installations. Including rooftop solar adds 1,200 MW to the total for 2014, according to a GTM Research report released this week. But the EIA does show that solar power is gaining ground. Natural gas’ share of new generation has held steady at about 49% in the past two years. Wind’s share is buffeted by the winds of political policy and has bounced between 5% and 45% over the past three years. But solar power has jumped from just 5% of new additions in 2012 to over 20% in both 2013 and 2014. The GTM numbers show even more penetration, with solar accounting for nearly one third of the new generation installed last year. Just as notable is who is putting in the new solar facilities. In 2014 only 68 MW of the 3,408 MW put into service were installed by utilities. Virtually all the rest were installed by independent power companies. That trend is also evident in the 2012 and 2013 numbers, with utilities accounting for less than 5% of the new installations in both those years. Traditional utilities appear to be worried, but rather than letting in the light, many are trying to shut it out. Salt River Project, one of the largest utilities in Arizona, recently imposed a $50 surcharge on customers who put solar panels on their rooftops. SolarCity says that excludes them from that market, and has filed a lawsuit in U.S. District Court contesting the surcharge. While that battle works its way through the courts, utilities will no doubt continue to draw on the mechanisms of incumbency to defend their turf, while solar companies will continue to look for ways to innovate and compete. PV prices have fallen dramatically in the past several years, and continued reductions may not come as readily. But as the National Renewable Energy Laboratory recently noted, further price reductions could come from improvements in efficiency and from reductions in overall system costs brought about by new financing vehicles such as the solar bonds SolarCity sells. Utilities are not going to be easily flushed down the drain of history, but it remains to be seen how effectively they can resist the rising tide of innovation.